I started collecting the wishbones from my roasted chickens many years ago. They reminded me if my Gramma. She told me that instead of breaking the wishbone you could let it dry out then paint it with clear nail polish and wear it as a pendant. “That way you could make wishes as often as you like,” she told me smiling. 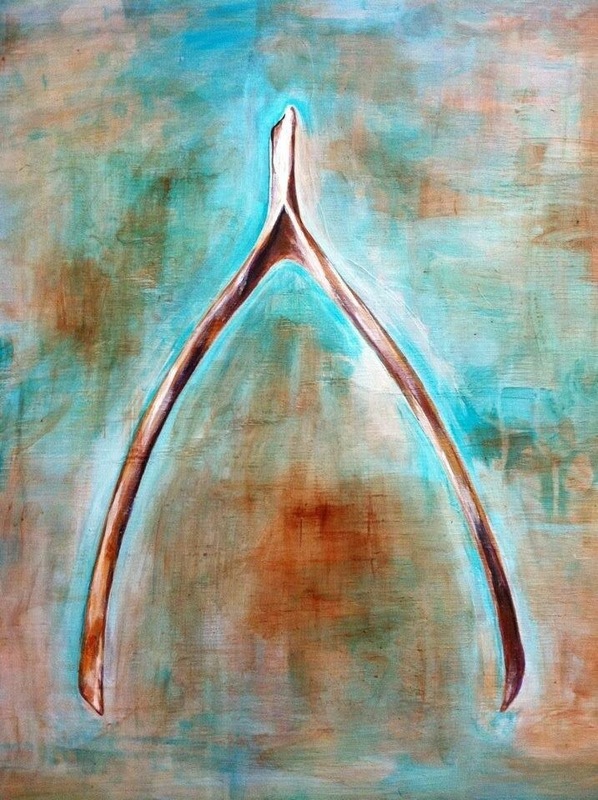 The first wishbone I painted that was stolen. 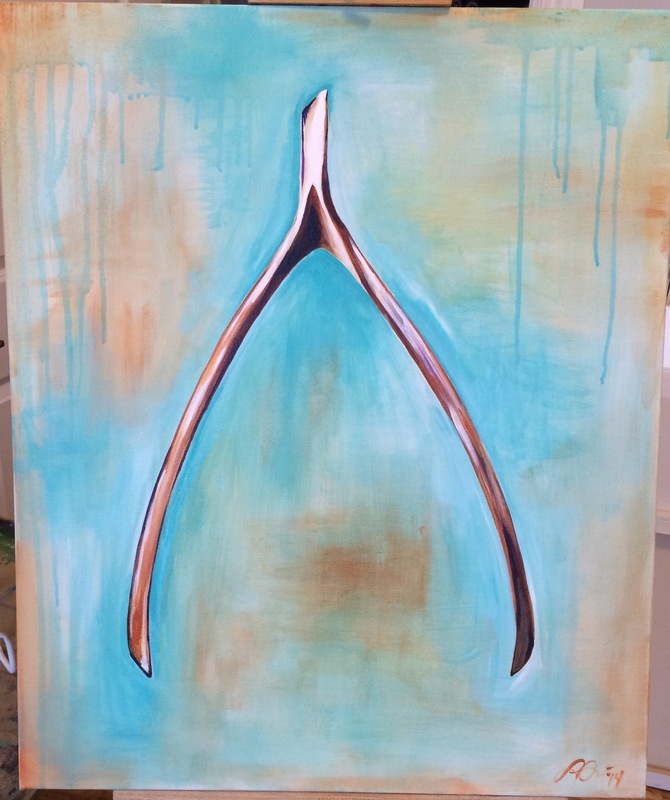 This wishbone I created to auction at a benefit event. 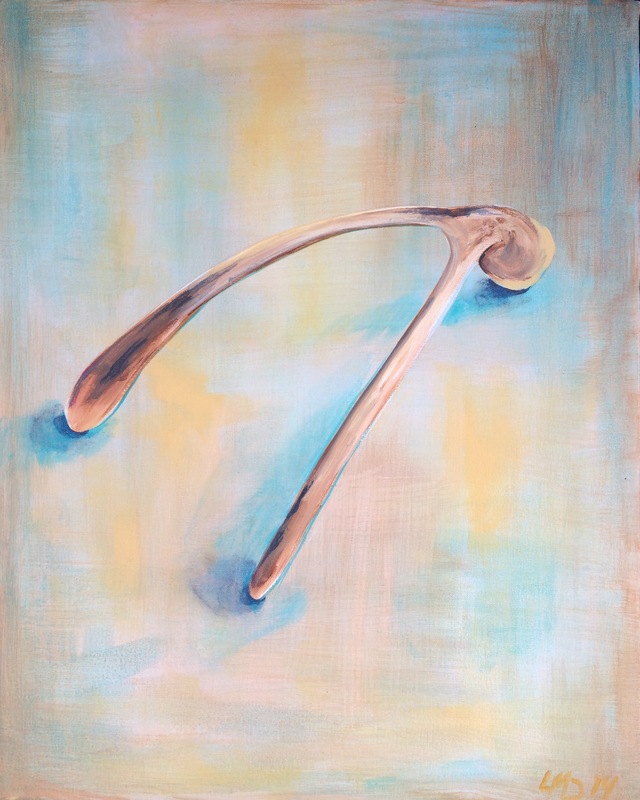 I have painted a few pieces that feature wishbones, they are simple compositions that highlight the beauty of this lovely bone. The paintings are popular and I’m sure it’s because the wishbone reminds us if when we were children and we took hold if one end wishing our wish and hoping for the large end. So many times the bone simply shatters into pieces destroying the wishes of both parties and the chance to ride the horse is gone. Last summer I found myself in a situation where my travel plans coincided with the end of my apartment lease. I couldn’t renew because they wanted $300.00 more a month. It was my most favorite apartment ever but I would have had to give up travel to afford it and that was just not going to happen. My friend, Karin, offered her second bedroom as a place to stay until I could find a new place when I returned from my travel. We took long Saturday morning walks with the dogs to get coffee, we brunched at Lula’s and chatted with our favorite bartender and we watched Orange Is The New Black together. Both of us in our forties we felt a little like we were in our twenties again. Karin went through some emotional struggles during this time and so did I. We are lucky that we had each other to lean on, to talk to, to share our fears. When I finally found a new place I think we were both relieved to get our own space again but we were also sad. Karin would not accept money from me so I knew I’d have to repay her with a painting. She expressed interest in one of my wishbone pieces that I sold so I created one just for her. I wish for us to always be friends.